Every June a mass of game developers, journalists and retailers converge on the L.A. Convention center for 2 days. E3 is widely considered one of the biggest – if not the biggest – video game convention in the world, with a weekly attendance easily surpassing 40,000 people. Because of its size, it can be a massively daunting experience to some people; information is constantly coming out and it’s easy to miss something. Well fear not readers! I have rummaged through the colossus that is E3 to bring you the best of what the show offered. As we can see, the PS4 has a massive price difference than the Xbox One. Also worth noting that the PS4 has no used, or sharing, game restrictions and is region free – allowing service members and travelers to take their PS4s anywhere they desire. The PS4 also will allow people who also own Vitas to wirelessly stream any game to their handheld device. Gone are the days of pausing a game to use the bathroom. The future is now, ladies and gentleman. Microsoft has received a lot of bad press surrounding the Xbox One – particularly on its online requirements and game sharing and ownership rules. Sadly, Microsoft chose not to address any of these issues during its press conference. However, despite all the bad news, one feature coming to the Xbox One may redeem it for most of its faults. The Xbox One is reported to have some sort of ‘Family List’ that you can add up to 10 people to. The people in your list will have access to any games you have bought for yourself. So for instance, if I get Watch Dogs and I add my friend to my list, he can log onto his console at his house and play my copy of Watch Dogs without any restrictions. That’s kind of cool. Nintendo didn’t have any new console announcements, but they definitely played to their strengths and announced quite a few new titles for the Wii U and 3DS. New Wii U titles: Yoshi’s New Island, Wii Party U, Wii Fit U, Super Mario 3D World, Super Smash Bros., Sonic Lost World, Pikmin 3, New Super Luigi U, Mario Kart 8, Legend of Zelda: The Wind Waker HD, Donkey Kong Country: Tropical Freeze, X, and Bayonetta 2. Some big names are in there, most notably Super Smash Bros, Donkey Kong Country, Mario World, Mario Kart and Zelda. The return to their core franchises is a smart move by Nintendo. As of late, Wii U sales haven’t reached Nintendo’s expectations. In part due to product confusion – people simply don’t know the Wii U is a next-gen Wii – and a lack of titles to draw people in. 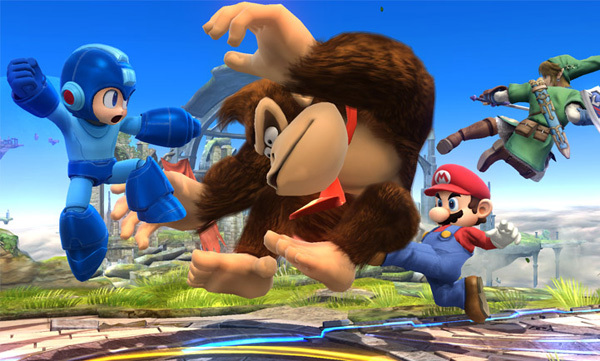 With the return of the big names, I think the Wii U will be a big seller this holiday season. I know I’ve been convinced to buy one now. I can’t resist Donkey Kong and Mario Kart. Nintendo knows my weaknesses. Also for you 3DS fans out there, Pokemon X/Y, Phoenix Wright: Ace Attorney – Duel Destinies, The Legend of Zelda: A Link Between Worlds, and a handheld version of the new Super Smash Brothers. Every E3 has its share of games that ‘wow’ us and those that disappoint. And sometimes there are a few surprises thrown in to keep things fresh. Below is a list of games to look forward to with videos to each. I recommend at least checking out Tom Clancy’s: The Division, Battlefield 4, Destiny, and Watch Dogs. So there you have it. It was an exciting E3 with technical glitches, boos, cheers and surprises. Stay tuned to ReviewSTL for my ‘Best of E3’ picks where I’ll go into more detail on the games I’m most looking forward to!